Winemakerssister: A Happy Scavenger.... Or Is It Scavengee? Crossposted on winemakerssister and Scavenger Hunt Swap. Ok, Scavenger Hunt swap spoiler -- show yourself! I received a wonderful box filled with goodies from Norfolk VA today... but with no name attached. Everything is clever and fun and well thought out. I love it all! 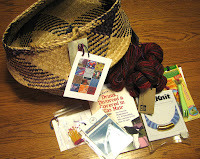 Something with a "T" - a big, lovely lightweight tote, perfect for holding a larger knitting WIP, eh? Something green - needle felting claw and mat cleaner. You're right spoiler, one can't have too many felting tools! Something hard - "Mag Knit," a fun clasp that turns beads or I-cord into a necklace. Should be fun to play with! Something local - a lovely light shawl pin made by a local artist and knitter. Something funny - a wonderful, whimsical, giggle-inducing little felt pin entitled "Garden" from Keri Rounding's Etsy shop. Spoiler's choice - The book, "Crazy Aunt Purl's Drunk, Divorced & Covered in Cat Hair." Ok, I'm a professional drunk (who's constantly covered in cat hair), so it's perfect for me! Sounds like a very fun read. Thanks so much, my nameless spoiler.... it was very much worth waiting a few extra days! Wow you sure get in some good swaps! !This one is going to be good,too.Promise! Woops!! I knew I forgot something! Erin Collins, you're happy swapper!